This is a cleverly written novel with a gripping storyline. Navarro has written in such a way that you have to sift through the information to find out exactly what is going on – and with so many subplots to follow, this takes a while. The twist at the end is rather interesting too. It should have been obvious to the reader as there are plenty of clues throughout as to how things will finish, but they are only obvious after you have finished reading the book! The first couple of chapters are rather slow but, as seems to be common with well-written books, this is necessary in order to introduce the main characters. After 20 pages or so the pace starts to pick up. The story starts with a mysterious person going to confession in St Peter's, to ask for forgiveness for a murder he is about to commit. This information leaves the priest, a shy and awkward young man called Gian Maria, totally stunned and horrified. Although bound to silence by his vows and the sanctity of the confessional, he makes it his mission to try and prevent the murder from taking place. His travels take him to Iraq, just before the outbreak of war, to a small, dusty village called Safran where an extraordinary archaeological dig is frantically underway, attempting to unearth a series of clay tablets before the bombing starts. Several different parties are very interested in this so-called "Bible of Clay", which is believed to have been dictated by Abraham himself, some 2,000 years before the birth of Christ. Finding the tablets will finally prove that Abraham actually existed and the priceless artifacts will secure the futures of the team members searching for them. Not everyone hunting for the tablets is who they seem, however. In the background are two separate groups of wealthy elderly people: one group wants the tablets for their own selfish monetary gain and the other has far more sinister plans and has hired a hitman to murder Clara Tannenberg, one of the principle team members, along with her dictatorial grandfather Alfred, who found the original pair of tablets that hint at the existence of this clay bible many years ago. The connections between the various groups, and the people they hire to infiltrate the dig, are rather complex. We are slowly told the story of what happened and why people are motivated the way they are but the truth is shocking. The only selfless person in the entire story is the young priest. As the days before the start of the war pass, and the pressure on the archaeologists increases, so the excitement in the story builds as you wonder how they will escape and whether the hidden hitman will either be discovered or successful. Everyone suspects everyone else and you, the reader, are just as on edge as the characters in the book, despite not really liking any of them. The twist towards the end of the book is just wonderful but the actual ending itself is a little disappointing after the enormous pressure built up just beforehand. Having said that, though, the book is a great read and will keep you both guessing and horrified the entire way through. I thoroughly recommend it. 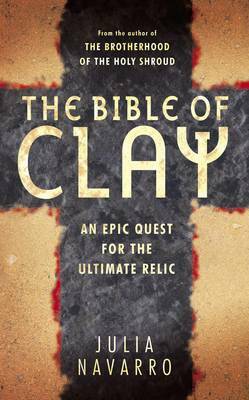 Read another review of THE BIBLE OF CLAY.